Byta - Blog "Account Detect, For More Secure Audio Sharing"
Until now we’ve been forced to use different tools and services to share digital audio based on each different need. WeTransfer & Dropbox for quick file sharing to collaborators, Soundcloud for streams or watermarked promotion and other secure media services for higher security. Byta offers Senders the flexibility to decide the level of security on a per share basis, eliminating the need for multiple tools and services. For most, sharing security isn’t a priority. You know and trust the recipient and/or you have zero concerns about your audio ending up with anyone else. Those users don’t need to think about watermarking, limiting the number of downloads or setting expiry. Secure audio sharing isn’t solely about watermarking. Being practical about how you share is equally important, no matter who the recipient is. Combining Byta’s flexible Share settings with the ability to detect if a Recipient has an Account offers a new and unique range of security options. Sharing your audio as streaming only, be it watermarked or not, is still the most effective way of ensuring files don’t end up with someone else by mistake. Additionally, setting expiry ensures Senders don’t need to continue monitoring stream counts for suspicious behaviour. There’s no question a stream behind a login offers the highest level of security possible when sharing audio online. Meanwhile, everyone knows demanding Recipients sign up en masse is the best way to discourage anyone from listening. So where’s the middle ground? 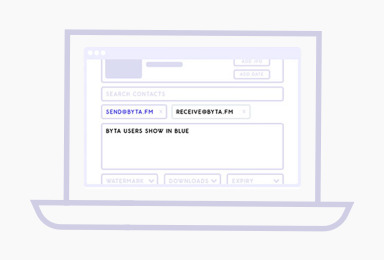 Now whenever you add Recipients to your share users with a Byta Account will show as blue (image above). This way you know you are sharing your audio as securely as possible. Someone not a user? Ask them to sign up, then check before sharing. Who could refuse a personal request? You are merely being conscientious when letting certain people listen before anyone else… and they are one of those first few!